The freedom we have is simply amazing. And while we still deal with everyday life, there is serenity all around us. It’s a slower pace, a simpler life, and we are much more deeply connected and happy." It's time to stop dreaming and take action! and have a life of adventure on the road! Do you dream of waking up with a new backyard every day of the week? One you don't have to mow, rake or otherwise maintain? Do you imagine sipping a steaming coffee with your loved one while watching the deer roam through your campsite or sharing stories with new friends while you watch the sun set over the desert? Or the Pacific Ocean? Or the Alaskan wilderness? How much is freedom worth to you? How about peace of mind? Are you looking to erase the doubts, fears and niggling countless details standing in your way to choosing RV freedom now? If so, then this could be the most important letter you ever read! Would you like to sleep at night instead of making endless lists and wondering how you’ll pull off your full-time RV lifestyle? If I could give you all the information you need to decide if full-time is for you…. If I could save you hours and hours of research and mind-bending soul-searching and endless sifting through boring details to get the real goods…. Think about it. The right information can help you make the right choices and avoid costly mistakes. Good information is the most powerful thing you can have when you are looking to make changes in your life. You want to simplify your life! The worst thing you could do is get off on the wrong foot by making bad decisions that will cost you time and money, not to mention the headaches and hassles. Listen. The goal of RV Freedom Now is to help you make those all-important decisions so that when you drive off into the sunset you can do so knowing that everything will run like clockwork in your new life. It could take you years and countless hassles to figure out the right combinations to make your new life as joyous and stress-free as possible. and are still doing it. In the RV Freedom Now Step-by-Step Guide you not only get all of the research already compiled for you in one convenient place (over 100 pages), but you also get to learn from others’ experiences through the Case Studies. You’ve probably heard about investing using OPM – other people’s money. It’s the way financial advisors tell you to get ahead. "Your new e-book is ... well, awesome! I am up to about page 50 or so and it gets two thumbs up ... actually 4 thumbs up but I only have two!! I will certainly promote this publication to my readers as I consider it an asset to anyone who is fulltiming or considering the lifestyle. Well done, Kate. " "Your book is brilliant. I really enjoyed it. My Mum retires next year and is planning on getting what we in UK call a camper van, i.e. a small RV. Although your book is written for US and Canada, there is a huge wealth of really useful information and points to consider when setting out and a lot of it will be very useful to her. It is well laid out and easy to follow. There is so much in there that I would never have thought of. To have all that information to hand is invaluable. Thank you for an excellent resource." "I found the book to be a very clear and concise step by step introduction to the world of mobile life. Gave me everything I need to know to get a start. A great book for anyone looking into the RV lifestyle and wondering how to go about it. Kate answers a lot of the questions that will come up in the minds of the mobile traveler." "I read your guide and have been browsing through it again and think it's great. Very comprehensive, beautifully written and intelligently constructed. I'm sure it will be a real "go-to" book for all kinds of RV enthusiasts." 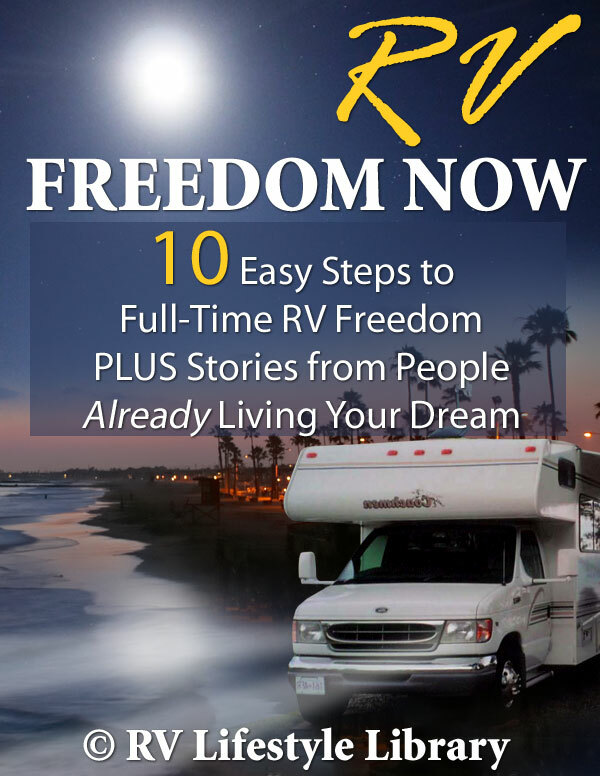 I just read “10 Easy Steps to Full-time RV Freedom”….twice and have to say it answered questions I hadn’t even thought of yet. What a great book! It covers every base, from beginning to end. Each issue of the process is covered here from what to travel in, how much money it will take, banking on the road, leaving friends behind, storing your stuff, phone and internet, health care in the U.S. and Canada, the list goes on. It was particularly helpful to see the many web links and resources listed. It is one thing to be advised about the possibilities of full-time RVing and another to be lead right to the places and sources you’ll need. This book took me directly down a logical path and it saved me weeks of searching and finding these things out for myself. Life on the road will be sweeter with fewer incidents, I’m sure, now that I have this great book of how to do it well and do it right. I highly recommend it. If you’re anything like me, you’re probably a little skeptical and a bit on the conservative side. But think about this – you could start living your dream today with real adventure (instead of the mis-adventure of chaos and things going wrong) and then... you really would find freedom now! Take the Leap into the New Life you are Dreaming of! "I hope that my example proves ...to my granddaughters that they truly can achieve whatever goals they put to themselves– they will know because they have seen it done by grandma – they do have the power to make their dreams reality..."
Listen, these people tell their stories in unabashed detail, offering you a true glimpse into the day to day life of living on the road. They spill the beans about the good things, the great things and the things they tried that have been complete disasters. If you are sitting on the fence, or analyzing yea or nay until you are red in the face, or just need a clear route to your desired destination, you need RV Freedom Now. Okay, So What’s the Cost for this Incredible Resource? Well, realize that having access to this type of information is not only going to give you peace of mind by making your decision-making easier, it is also going to lay out all the secrets and information at your fingertips so you don’t have to waste your time chasing it down. Listen, I spent hours going into every minute detail, analyzing, scouring unknown sources and unearthing more and more information. Frankly, although I was excited about starting my new life, I would have been happy to pay somebody else because then I could start moving forward and begin living the life I wanted rather than researching it. But now you can benefit from that research! In fact, your total investment for the RV Freedom Now Step-by-Step Guide (complete with Case Studies) is only $49 $39 (introductory price). So why am I practically giving this away? Well, it’s pretty straight forward. I’ve already done all the research and I know how hard it was to sort out all the details. I truly would like other people to benefit from my learning curve. Plus, I wanted to ‘chat’ with the folks I invited to contribute. Putting together this book gave me a chance to contact and get to know some pretty amazing people that are living their dreams. I found them all really inspiring and I want to share their stories with you. Also, because it’s a digital product and since you’re accessing this directly from the Internet I have no inventory and no mailing costs. I don’t need to pay anyone to take orders over the phone or print labels. So I can happily pass along the costs savings to you. You win and I win. Even if you're a seasoned pro at this nasty task, you are likely to find some time-saving tips in this handy list. A $9 value. If you're going off-road, boondocking or traveling out of the country, this check list can make the difference between being stranded for days or back on the road again. A $9 value. A great check list that covers all the basic tools - just add the specific ones you'll need for your rig and you'll never be unprepared. A $9 value. I want to give you even more! When it's too hot, even the cooks get out of the kitchen! And with Tim Dale's book on Dutch Oven Cooking to help you cook outside, you can do just that. This innovative resource helps you pick the best dutch oven, use it effectively, and includes several delicious recipes sure to become favorites. This is a $12 value. This virtual book spells out how senior homeowners can access hidden cash in this essential guide to reverse mortgages - the home equity loan that gives you cash now, and lets you stay in your home for life with no monthly payments. Use the money to buy a new RV or just about anything you want. Get the money in a lump sum, monthly checks, a line of credit, or a combination of all three. Reverse Mortgage Magic details how your home can be your retirement account. Getting to your dreams is about knowing what you want. With this workbook, you'll learn how to define your ideal day and then create it! Imagine yourself living in your RV, listening to the chirping birds or gazing over an azure lake...Knowing what you want is half the battle. This workbook offers a different approach to goal setting and to getting what you want. This is a $27 value. There you have it. With these bonuses, and the RV Freedom Now Step by Step Guide and Case Studies you’ll not only have a head start on planning your new life…you will be out of the starting gate on the road to your dreams while others are still trying to sort out the details. Together these bonuses are worth almost twice your investment in RV Freedom Now but they're all yours free when you order today. Your purchase of RV Freedom Now is completely guaranteed. In fact, here’s my 100% Your Way or the Highway Guarantee. If you aren’t 100% satisfied – I don’t want to keep your money. Simply send me a quick email and I’ll happily refund your money in full. No questions asked, and we’ll still be friends. But even if you decide RV Freedom Now is not for you – the free bonus gifts are yours to keep regardless, as a ‘thank you’ gift from me. That means you can’t lose no matter what! And you don’t have to decide right away either. I know that life is busy. Things get in the way. So you have a full 60 days to look the material over and decide if it’s for you. There is absolutely no risk whatsoever on your part. The burden to deliver is entirely on me. If you don’t think RV Freedom Now gives you all the steps and information you need, all the inspiration and Other People’s Experiences you had hoped for, just let me know and I will refund every cent you paid. It's that simple. Look, we both know that you might be able to find a lot of this information on your own. But at what cost? Do you really want to spend countless hours chasing sources to pull it all together? RV Freedom Now Step-by-Step Guide (and Case Studies). When you place your order you'll be taken to a secure page where your financial details will be encrypted to ensure your online security. Once your credit card is approved, you will be taken to a special download page where you will be able to download the Step by Step Guide along with your FREE Bonuses. Complete instructions on how to download the book and view it are provided on the download page and by support email. On the order page you will also have the option to pay using your PayPal account. Clickbank sells our products - they are a trusted online retailer specializing in digitally delivered products. It’s easy to get started right away. You'll have immediate access to the Step-by-Step Guide and Case Studies. You can't help but benefit from the GOLD of Other People’s Experience.. Those courageous and happy (did I mention they’re happy?) people who are already living your dreams. Collectively they represent several decades of full-time RV living! Plus, you’ll get all of the bonuses that we’ve already talked about - yours to keep no matter what. Getting ready to RV full-time can be overwhelming. Fear. Worry. There are so many details to think about. Making the wrong decisions can be costly and make your transition more work than it needs to be. Who needs that? Set it up right the first time and you’ll be living the relaxed adventure of your dreams from the moment you turn the key in the ignition. P.S. This package will be sold for $49. So grab yours now at the introductory price of just $39. You're not dithering are you? I've already nailed down all the details and information you need so you don't need to dither about the details. Order now and get on with living your dream! Just imagine! In no time at all you could be packing up your RV and living the life of your dreams - a life full of adventure and leisure. A chance to see new horizons, make new friends and create memories that will last a lifetime. Your new life can begin now. It’s all up to you. P.P.S. If you're still not sure, then at least sign-up for free tips on the RV Life!